Acarbose reduces food cravings by slowing the absorption of glucose and reducing sugar highs. Branded as Glucobay Acarbose, it helps diabetes sufferers live more normal lives. Acarbose can also counter aging caused by excessive insulin in our bodies. Acarbose defends your body by reducing blood sugar peaks. Glucobay Acarbose taken daily helps you feel full for longer by providing a more stable supply of essential blood sugars. Extensive evidence shows this weight loss can be achieved through regular Acarbose dosage. Diabetics clearly have a powerful ally too when they choose Acarbose for their daily therapy. Glucobay Acarbose also assists diabetics with weight loss. Acarbose provides the appropriate dosage and is tested and proven over two decades to ensure that diabetics weight loss can be maintained. It is the weight loss system physicians and patients trust as the number one Acarbose diabetes therapy. Glucobay Acarbose is your essential treatment because it helps regulate glucose, your body’s preferred source of energy. Diabetes means your body can’t regulate blood glucose levels without additional help. Glucose comes from carbohydrates found in a range of foods, while your body’s natural insulin effectively “unlocks” cells allowing glucose to enter them. Acarbose is important if your body does not produce insulin, or your natural insulin does not unlock glucose properly. In each scenario, you have diabetes. Glucobay Acarbose will help if you have Type 1 diabetes which results from the body’s inability to produce insulin. If you don’t inject yourself with insulin, you will die. Type 1 usually develops quickly and has classic symptoms of feeling thirsty, coupled with frequent and sweet-smelling urine. Glucobay Acarbose is equally essential if you suffer Type 2 diabetes due to insulin resistance. While you still produce insulin, your body is unable to use it to unlock cells. Type 2 may not have immediate life-threatening consequences but is a contributor to a number of serious long-term illnesses. 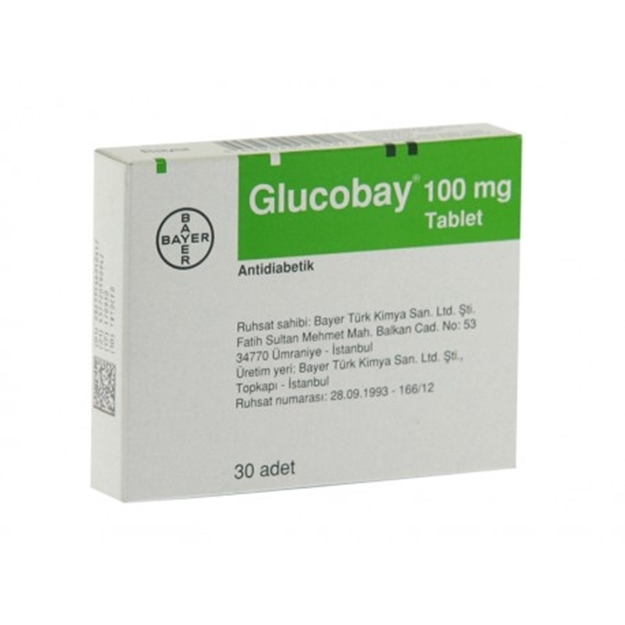 Glucobay Acarbose is ideal for Type 2 sufferers, by helping to reduce the risks of heart disease and strokes, kidney failure, limb amputation and the onset of blindness. Diabetes increases your risk of ‘Atherosclerosis’ – the clogging of blood vessels with plaque – and underlying cause of cardiovascular heart disease and strokes. Type 2 also causes blood vessels in your kidneys, legs, feet and eyes to narrow, which can lead to major problems. Launched in 1990, Acarbose belongs to a class of drugs known as alpha-glucosidase inhibitors. It works in the small intestine where Acarbose inhibits the actions of enzymes that breakdown complex carbohydrates into simpler sugars such as glucose. Glucobay Acarbose can either be prescribed as a single therapy, or it can be used in conjunction with other treatments. More than 100 studies have proven the effectiveness of Acarbose – in particular its ability to help delay the progression of diabetes and fight against cardiovascular complications. Acarbose may also help people suffering pre-diabetes – the precursor to Type 2. Research shows it can significantly reduce the risk of progressing to Type 2. An additional benefit of slowing carbohydrate digestion is that you feel full for longer – a powerful appetite suppressor. With age, we produce more insulin to cope with increased blood-sugar levels, as our cells gradually become more insulin resistant. However, too much insulin is damaging, causing premature aging. But by taking Glucobay Acarbose, we reduce our desire for glucose-rich foods. For antiaging and appetite suppression, take one 50mg Glucobay Acarbose tablet one to three times daily. For diabetics, the dosage should be set by your doctor. Acarbose has an excellent safety record but may initially cause flatulence, diarrhoea or abdominal pain. If this happens, reduce or stop the dosage then gradually increase it again. Any effects should then disappear. Do not take Acarbose if you suffer from intestinal, inflammatory or ulceration disorders. Glucobay Acarbose delivers on many fronts: from combating diabetes, to weight loss support and promoting antiaging health, Acarbose is the answer. Treating hypoglycemic episodes (“hypos”). As a diabetic you may also be receiving other treatments for your diabetes. If you are taking insulin or sulphonylurea drugs to control your blood sugar, you will probably be used to avoiding hypoglycemic episodes by taking sugar when you feel that your blood sugar level is too low.